I think this is a pretty simple concept. I have one sound card and one pair of bluetooth headphones. 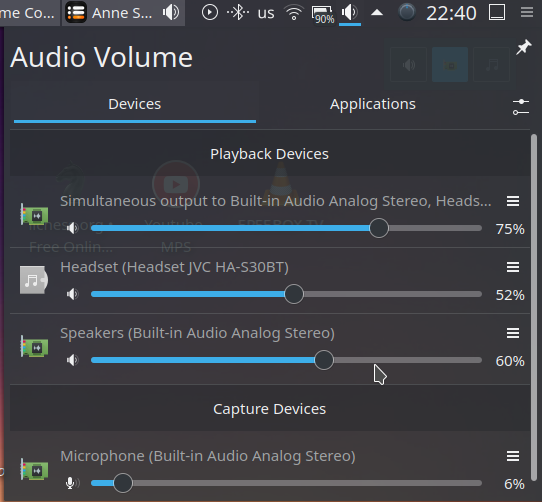 I want to play my audio through both my sound card and my bluetooth headphones. 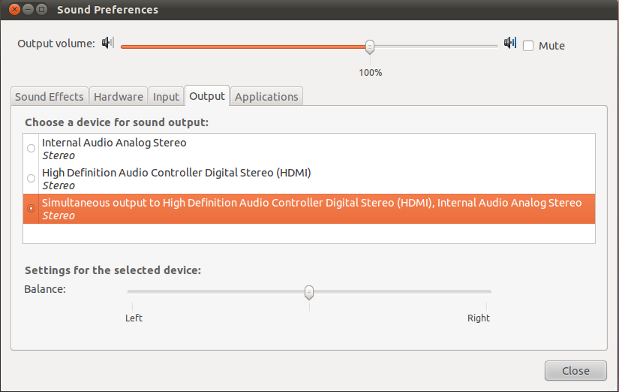 I believe Windows has checkboxes allows you to "check" outputs to enable/disable them, but Ubuntu seemingly has the equivalent of radio selectors (you can only select one at a time). Bonus Question: On a similar note, I have 5 analog output channels on my sound card (in addition to my digital & HDMI audio) -- I would like to be able to determine what comes out of each of those ports (e.g. 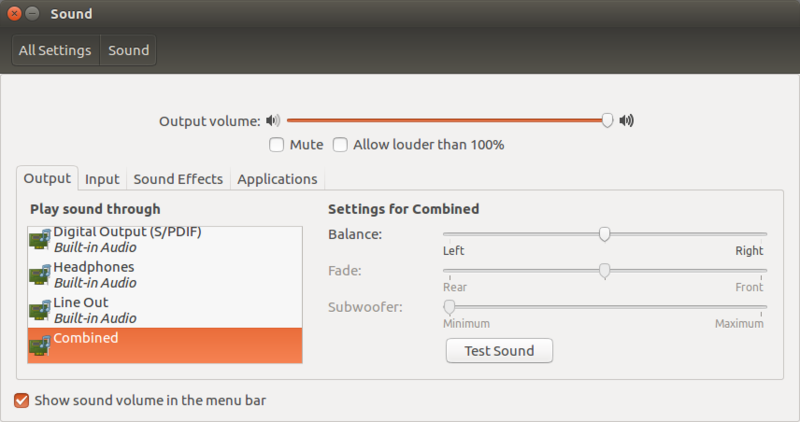 "front speakers" on all 5 or "front", "center", "back", etc). In this example it is shown for a HDMI-device but as soon as your Bluetooth device is recognized it will also be available for simultaneous output. The changes may need a restart of pulseaudio to take effect either by logging out and back in to your session or by running pulseaudio -k in a terminal. I've just confirmed this solution (from 4 years ago) still works on Ubuntu 14.04 LTS. Open terminal and type sudo apt-get install paprefs go to the tab exactly as per the picture above and select the option. Then; remaining in terminal, type pulseaudio -k to kill and restart pulseaudio. 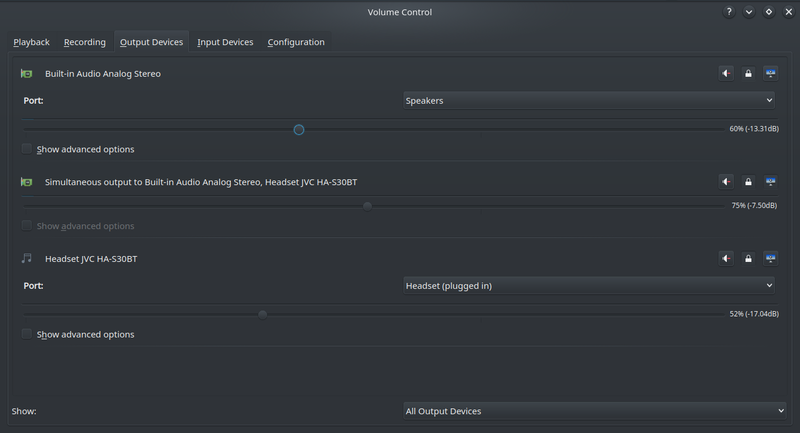 Then go to your sound settings and you will see the option to output to multiple sound devices. Props to whoever wrote paprefs it's a brilliant little piece of software I would actually like to see included in Ubuntu without requiring additional installation. A similar solution is available via an included piece of software and whats so great about pulseaudio is that the sound seems to be perfectly in-sync from both outputs so it must be adjusting for the lag as well which is why its so impressive; otherwise we would be hearing a slightly delayed version from one output and another. I could not get Takkat's proposal work out of the box in Debian 8.7, although I restarted the system. I assume you have completed Takkat's proposal in installing paprefs. Extension on Takkat's answer which works based on Arch Linux wiki where keep analog input and Pulse calls that "duplex"
A new output option should become available after reboot, called “Simultaneous output”. 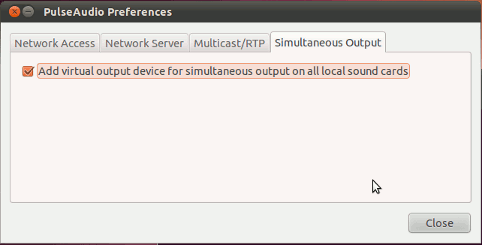 In 18.10 with Plasma 5.13.5 that “Simultaneous output” option has been removed, so aprefs is needed. Not the answer you're looking for? Browse other questions tagged sound pulseaudio audio-jack or ask your own question. Switch between headphone and speaker automatically? Is it possible to connect two wireless headsets (Bluetooth or RF)? How to play normal and bluetooth speakers simultaneously? How can I specify which programs play sound through headphones and which ones play through speakers? How to configure 2.1 speakers?